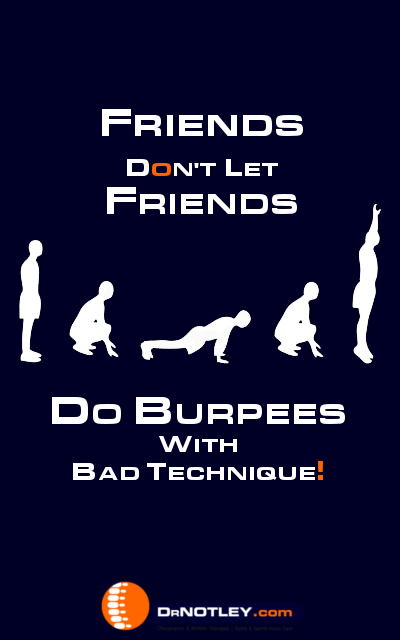 Burpees are touted as one of the best body weight exercises that can be used for metabolic conditioning. It is loved by some and loathed by many. In its most basic form it takes you from standing to the bottom of a squat to a tall plank position (top of the pushup) back to the bottom of the squat and back to standing. Often added in is a pushup and a jump at the top. As a Chiropractor, back pain is obviously a common problem that I treat. Intervertebral disc herniations and derrangements are often seen in my practise. The mechanism of injury is repetitive flexion (bending forward at the lower back) or flexion with rotation. When looking at the movement from the bottom of the squat to the tall plank (top of pushup position) and back to the bottom of the squat there is a large amount of hip flexion needed. If performed without adequate hip mobility the lower back will have to flex. Twice during each repetition this flexion will occur. So if you perform a 7 minute burpee test and you complete 75 repetitions you will rapidly flex your lower back 150 times. This increases your change of aggravating your lower back. It it best to make sure that the lumbar spine is kept neutral during the movement. The movement should be predominantly from the hips. If you can’t get down to a full squat then consider using a bench to put your hands on rather than on the floor. Improving core stability and increasing hip mobility is important. Another part of the burpee that can lead to back pain is the transition from landing into the plank and reversing back to the bottom of the squat. If the lower back sags/extends excessively the facet joints (the joints between each vertebrae) can become irritated. 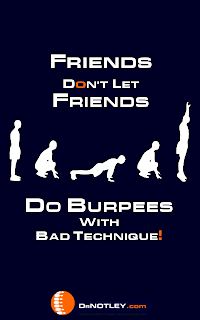 We wouldn’t accept a person performing a pushup up with the hips sagging so we shouldn’t accept it during burpees. The first video shows the spine staying in a relatively neutral position as the hips flex and extend. In the second video note the rounding of the back as she lowers into the squat and returns to the squat from the tall plank. Now, there aren’t any studies that look at the loads on the spine during the “unsafe” version but I am sure the load is more than the safe version. So if you have back pain during burpees it may not be because you core is weak it just might mean you are doing the exercise incorrectly. Protect your spine, improve performance. This entry was posted in back pain, Exercises by DrNotley. Bookmark the permalink.